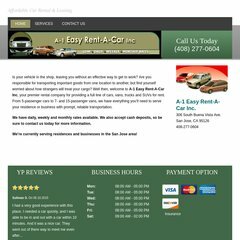 a-1easyrentacar.com A-1 Easy Rent-A-Car Inc. It is hosted by Icon Developments (Utah, Lindon,) using Netscape-Enterprise/4 web server. Its local IP address is 192.41.9.17. It has 5 nameservers, including dns02.gpn.register.com, dns03.gpn.register.com, and dns04.gpn.register.com.